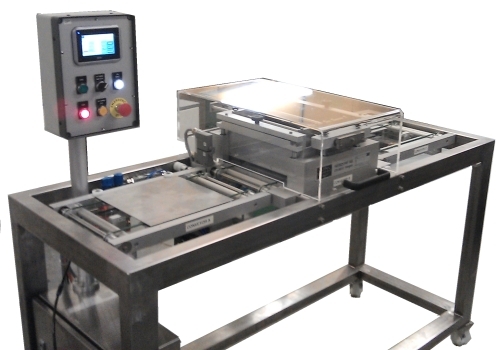 The Dosing and pressing machine is designed to dose and compress certain dry ingriendents with any type of binder. 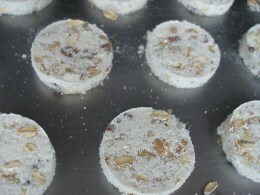 The product is stencilid directly onto the oven band by a retraction system. Machine frame in St.4301 completely mounted and machined to carry the former machine adjustable machine support feet to adapt existing oven conveyor height. Trolley section with Servo drive according to conveyor speed and row arrangements. Roller guidance with coil cover on all guiding bars. 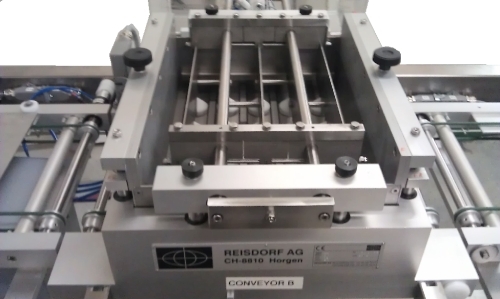 Former machine with retraction system (500 mm) in V2a complete mounted according to all functions. 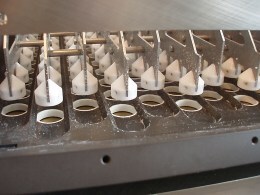 This version of machine is designed for laboratory purposes.